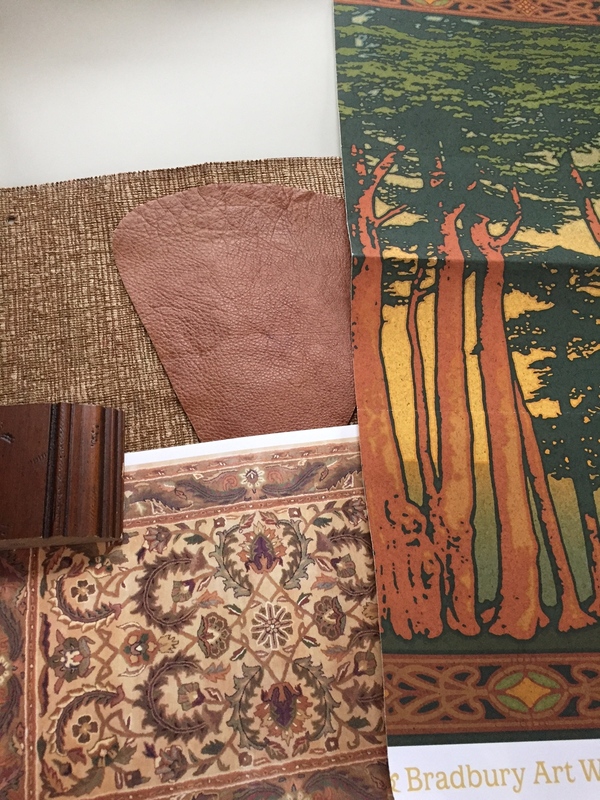 SAMPLES: Upholstery fabric, leather, wood finish, area rug photo, wallpaper frieze by Bradbury & Bradbury. Josh told me when we first met that he wanted a Stickley dining table and chairs. 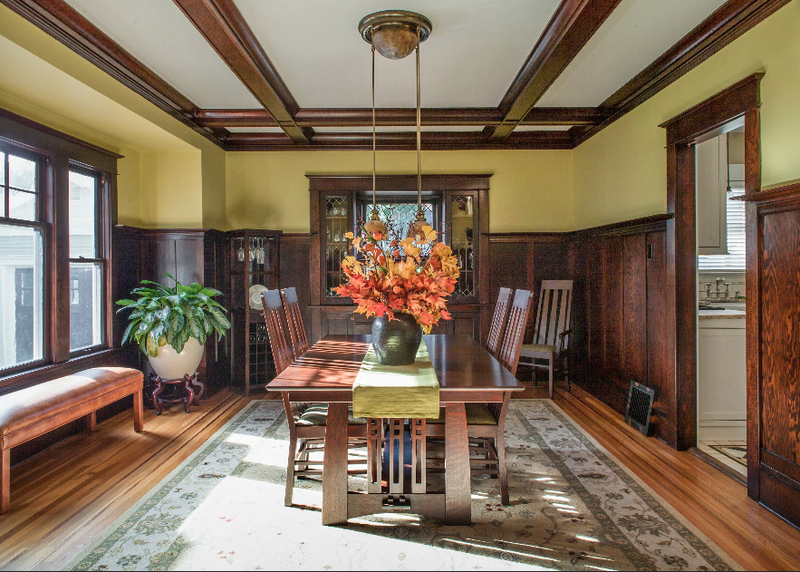 Often referred to as “Mission style,” this classic furniture emphasizes simple horizontal and vertical lines as well as flat panels that accentuate the grain of the wood, and epitomizes the Arts and Crafts movement. The beautiful table and chairs echo the warm wood wainscot and box beam ceiling, and the large scale of the furniture fits the scale of the room. A hand-tufted wool rug adds warmth and color, and an upholstered bench can be pulled up to the table for added seating when the table is extended to its full length. These rooms are now cozy, comfortable and functional, and reflect the harmony of the Arts and Crafts movement, with its ideals of honest construction, simple lines, and quality material. 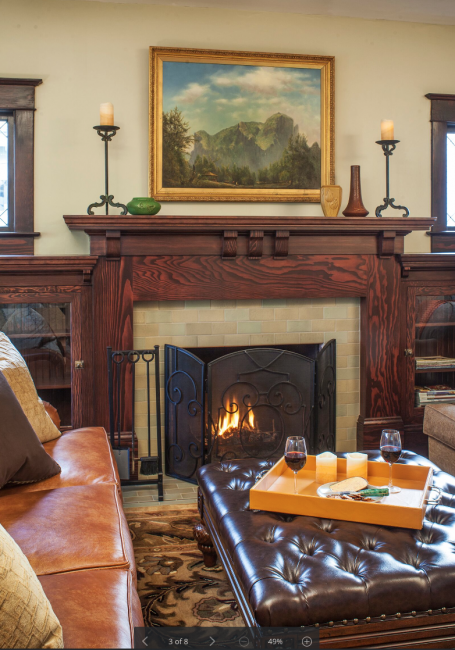 If you need help finding the right colors and furnishings for your home, give Emery & Associates a call. We can help you define your personal taste, and guide you through the complex process of creating a home that truly reflects YOU. There are 3 Comments to "Crafting for Comfort"
I can really empathize with Josh’s tastes; the wood, colors, and textures warm the cockles of my heart. You’ve created a lovely sense of unity. Kathia, I love it all: the lightening and brightening via wall and ceiling colors, upholstery and rugs; the juxtaposition of rolled arm furniture vs the heavy planes and rectangularity of the arts & craft woodwork, and the appropriateness of furniture, light fixtures, details and art. Great job! 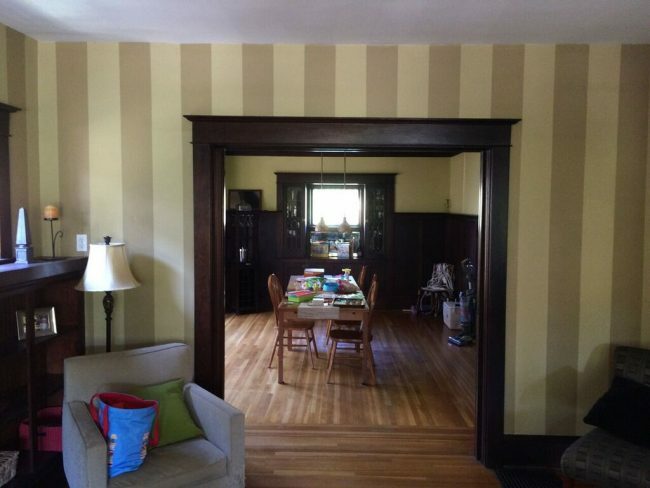 The magic of removing the stripes worked wonders! It’s always surprising how the mood of a room can be changed. The stripes and the busy fireplace were jarring but the redo is calming and elegant. Wonderful work!